Our CyberMonday promo continues this weekend all the way through Wednesday, December 3, 2014. Save an extra 25% off select Daylight Lamps with our cyber2014 Coupon Code (Please note: Discount will be shown after item has been added to your cart). Daylight U22080 Ultra-Slim White Magnifying Lamp XR w/1.75x Magnification and 7" Lens - The Daylight U22080 offers the latest innovations in lighting design such as the 28W Daylight™ fluorescent light, 17.5 cm/7" XR™ lens, and the new Free-Motion head-joint™. These features allow for an energy-saving, long-lasting tube; a 50% lighter lens, and precise, smooth positioning of the lamp without constant re-tightening. Daylight U25080 LED Ultra-Slim Magnifying Lamp XR w/60 LEDs and 50.4" Reach – The Daylight U25080 is a durable, powerful magnifier with 60 super-bright Daylight LEDs, a maximum reach of 50”, and a large 7” 1.75x magnification lens. It also features Daylight’s XR and Free-Motion technologies. Daylight UN1081 Naturalight Lamp 5" LED Floor/Table Magnifying Light w/a 5” 2x Mag. Lens – The Daylight UN1081 offers versatility for use as a floor magnifying lamp or a table lamp just by removing it from its pole. It features 21 top-performing, energy-efficient Naturalight LEDs that allow the user to easily see details and texts for applications like hobbies, crafts, and low-vision tasks. Daylight UN1040 Naturalight White Table Magnifying Lamp w/4x Magnification – The Daylight UN1040 may be have a compact size, but it offers the power for clear results. It features a 12W Full Spectrum Naturalight fluorescent tube and a 3.5" lens that help eliminate squinting and headaches and show you the difficult-to-see details you need to see. 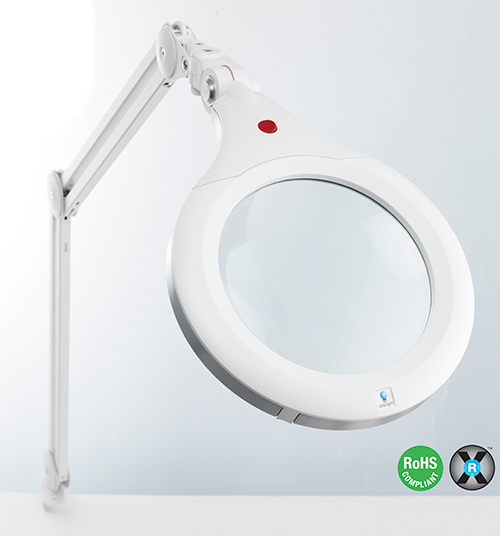 Daylight UN1190 XL White Task Lamp w/Clamp Base – The Daylight UN1190 offers professional, high-powered maximum light via 84 bright Daylight LEDs providing a brightness of 3400 lux at 12", while using only 21 W of power. It features an adjustable shade, multi-position head joint, and the ability to be dimmed up to 10%. For more information about our CyberMonday promo and to make a purchase, please visit our CyberMonday 2014 Promo page at QSource.com. You may also contact us via our Web site, phone (800-966-6020), or by email. Remember, this promo expires on December 3, 2014.